For years, our repertoire for Thai cuisine is pretty much confined to the realm of Pha Thai, Papaya Salad, Tom Yum Soup etc. 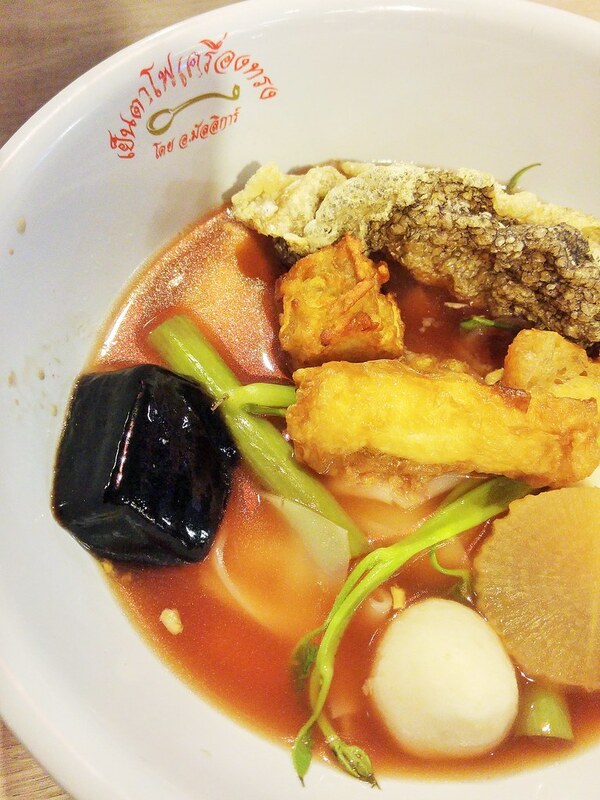 Till lately we got acquainted with Thai Boat Noodles but now there's Thai Yong Tau Fu! 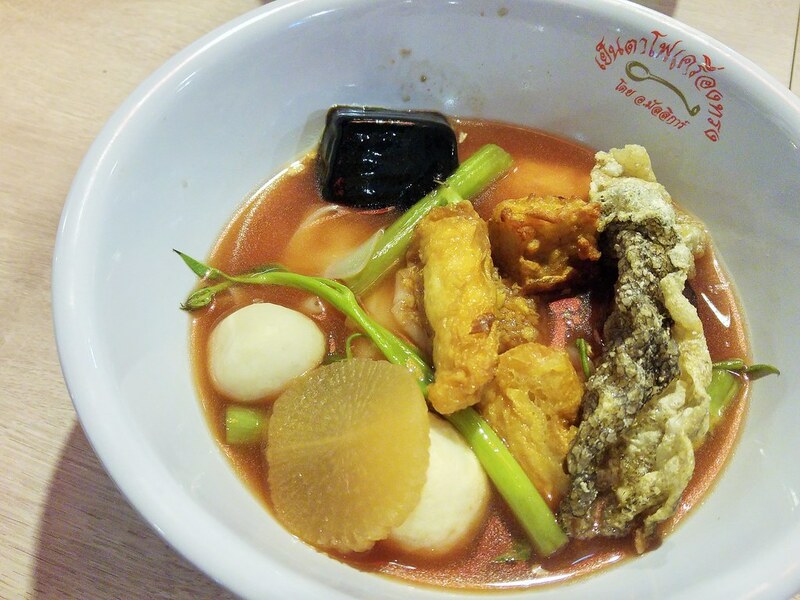 Yentafo Kruengsonge by Madam A. Mallikaun, a renown Bangkok ‘yen ta fo’ (as the Thais knows it) noodle chain, with 28 outlets in Bangkok and 2 in Laos. 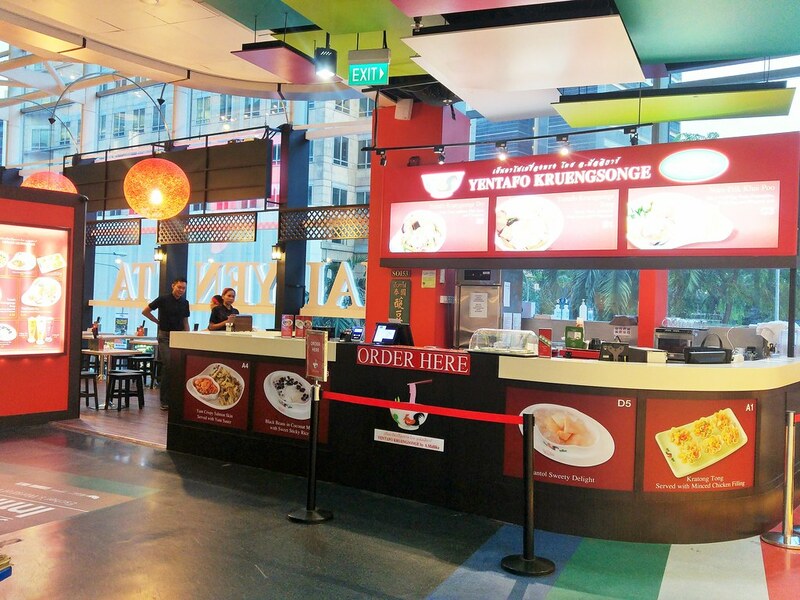 It has set up its first Singapore outpost at Cineleisure Orchard. We started off with some appetisers that really got our jaws moving. Kratong Tong ($5 for 6 pc) reminiscent of our Kueh Pai Tee – deep-fried pastry shells filled with stir-fried minced chicken, carrots, peas and corn. They tasted like chicken pie but accented with strong peppery taste due to the aromatics of the coriander root. 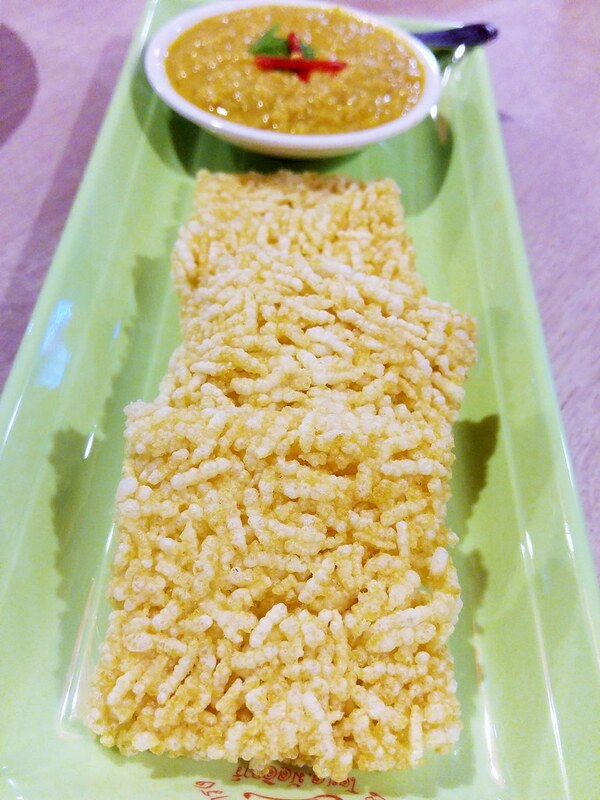 Instead of the usual candied version with sweet, caramelised sugarcane glaze, their Kao Tung Rice Crisps ($6 for 4 pc) is an exquisite, savoury version. Its nutty signature dip made with minced chicken and red curry paste makes the otherwise flavourless and pale rice crisp moreish and alluring . Moving on to their specialties, four choices of 'yen ta fo’ are showcased on the menu in Singapore. 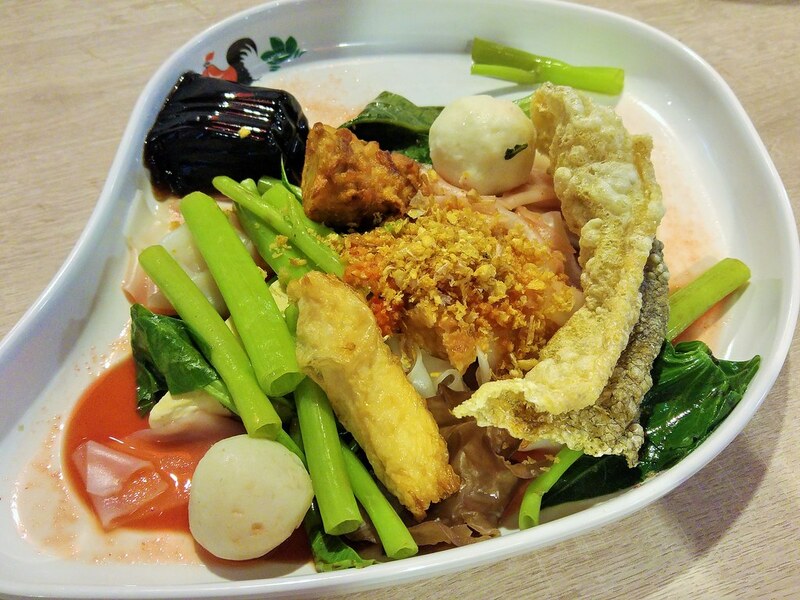 Simply pick their Yentafo Kruengsonge Soup ($8.50) which you get to try all the 8 items such as fish ball, squid ball, fish ball with tofu, fried tofu, fried seasoned taro and black fungus mushroom, paired with rice noodles in Madam Mallika’s quintessential broth and pink sauce. The broth, pink sauce and Kangkong are specially imported from Thailand. I like the Thai Kang Kong. Although they are much thicker, they add a refreshing crunch to the dish. You may be wandering what is that piece of grass jelly doing in my Yong Tau Fu? Back in Thailand, Pig's blood is one of the quintessential ingredients in Yen Ta Fu. 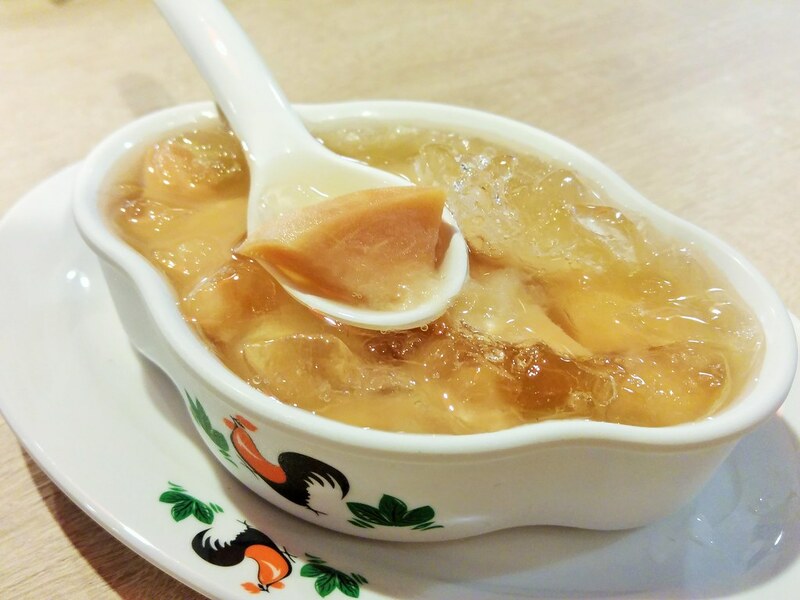 To keep the tradition, grass jelly is adopted to symbolise that significant curd. Much consideration has been given to the colour, shape and texture when choosing the supplier. How cool is that! 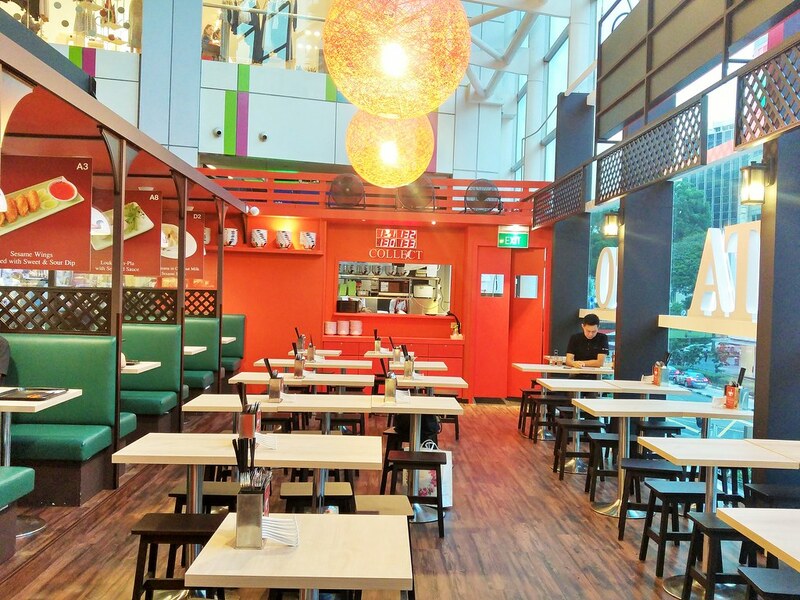 Similar to Thailand, customers can opt for three levels of spiciness for their choice of ‘yen ta fo’ - ‘Dek-Dek’ (not spicy), ‘Jai-Soh’ (spicy) and ‘Rod-Jeb’ (screaming spicy). Like an authentic Italian restaurant, you won't see any other spices or condiments on the table as Madam A. Mallikaun believes that her version of pink noodles is robust enough to go with sauces. Their dry version ($8.50) attests to that. We had ours ‘Jai-Soh’ (spicy) with a teaspoon of the chilli. It gives the noodles a fiery and tangy kick which was lacking in our non-spicy soup. Spicy is highly recommended for both version! 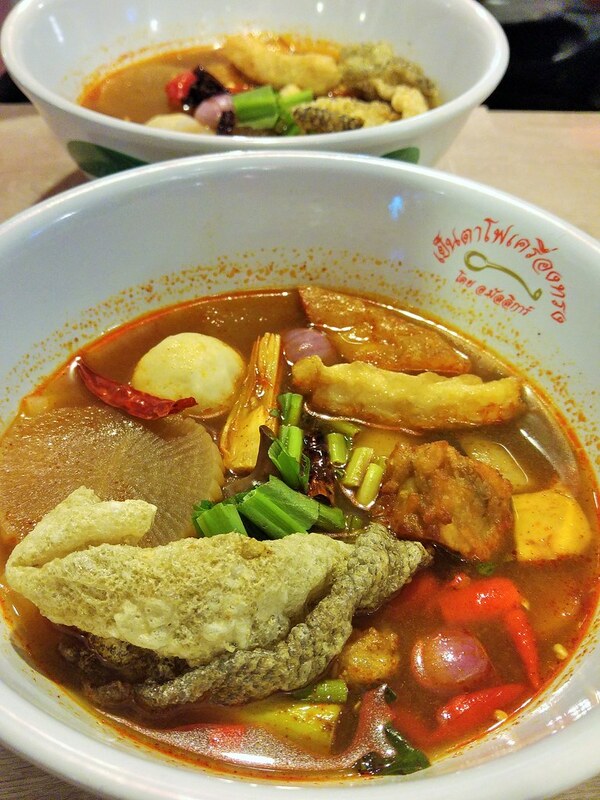 And by all means, give their Original Tom Yum Noodles ($9) a try. Made using the same broth base, they serve up a relatively sweeter tom yum soup that is more rounded in flavour. Fresh lemon juice is used in place of vinegar, whetting your taste buds with a citrusy kind of tanginess, instead hitting you with sharp vinegary notes. For something less stimulating, you can opt for their classic Kway Teow Kruengsonge ($8.50), a Thai-style clear soup noodle with six toppings. Knowing that the imported broth, which forms the base of all soup dishes here, is made from simmering pork bone, radish and coriander root, I'm certain that even their clear soup noodles will be as satisfying as the Yen Ta Fu. Both are available in soup and dry. Their menu also features a few unique Thai rice dishes, in which Nam Prik Khai Poo ($9) may caught your attention with its crab dip made with fresh crab meat and cooked egg yolk. Personally I like my vegetables to be simply blanched, hence this dish sits very well with me (apart from the oily and flat omelette atop of my rice). The dip is a balance of sweet, spicy and sour. The 3 signature flavours of Thai cuisine. What needs to be improved is perhaps its portion. 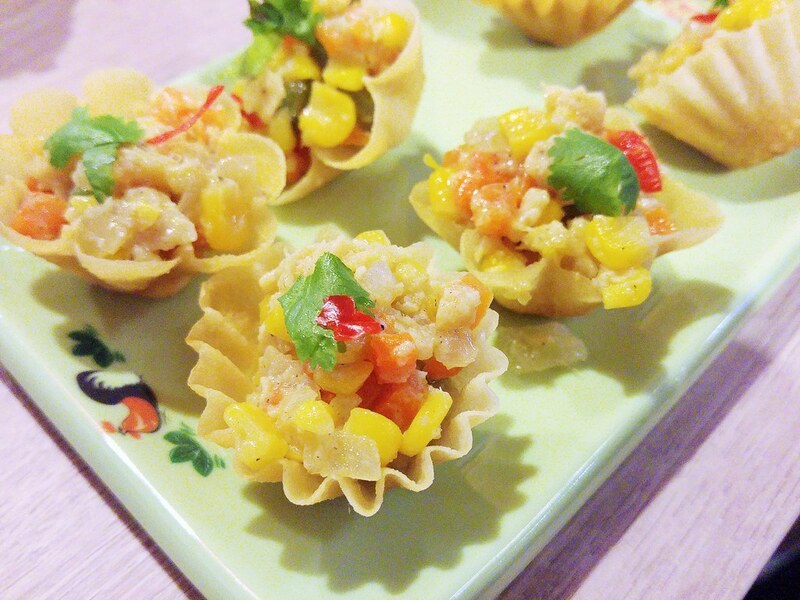 Reminiscent of a decadent salted egg crab, eat your vegetables if you want to savour the essence of the plate! 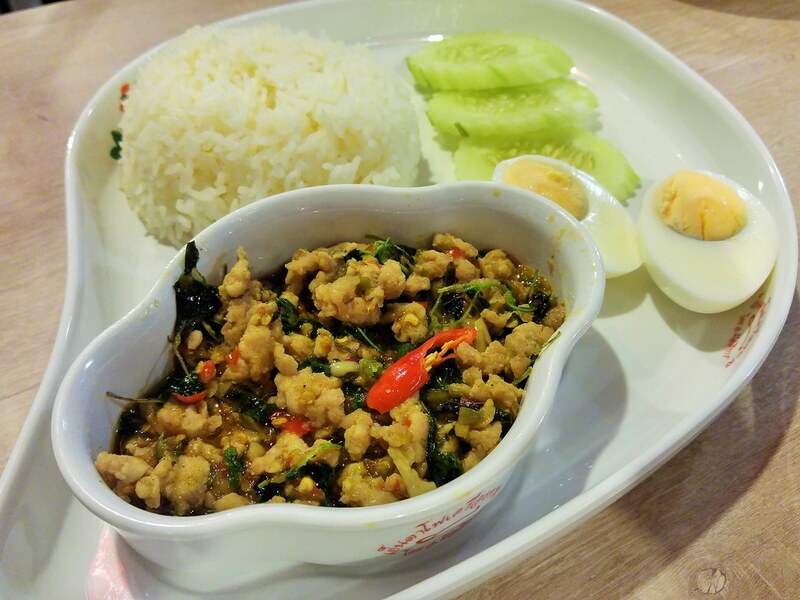 Gai Pad Krapow ($8.50) may set your stomach on fire. Putting the heat level aside, which ironically some of you may find it hard to stop. I quite enjoy the strong flavour of the Thai holy basil infused in the minced chicken. 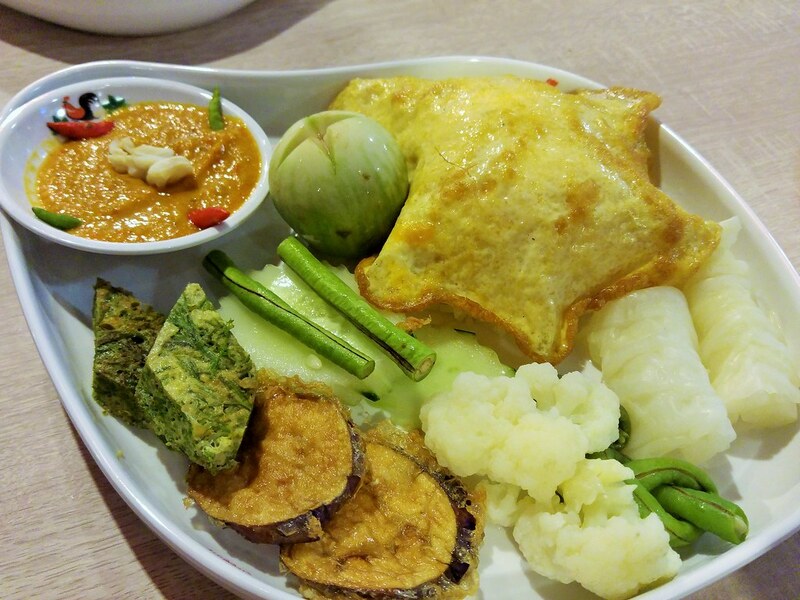 Not just the mains, Yentafo Kruengsonge also introduces us a range of different traditional Thai desserts. After all the heat and spice, wash them down with Santol Sweety Delight ($5). With flesh too tart to consume on its own, the Thais simmers this cotton fruit in sugar until it is soft, ingeniously turning it into a refreshing dessert. 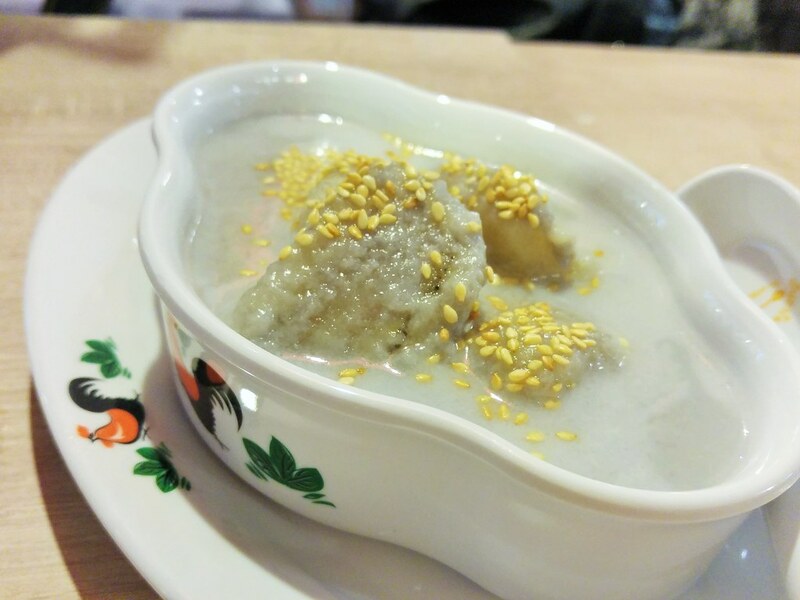 I like their Nam-Wa Banana in Coconut Milk with Sesame Seeds ($5) just as much, or perhaps more - There is a lot more play of flavours and textures in it. Compared to the cavendish bananas which soften under heat, these specially-imported Nam-Wa bananas that are grown in the central and North-eastern parts of Thailand, remain firm after being cooked. The freshly-squeezed coconut cream has a light consistency with caramelised sweetness from the palm sugar. Each bite was aromatic with nuttiness from the toasted sesame seeds, along with a touch of salt that complements its mellowness. 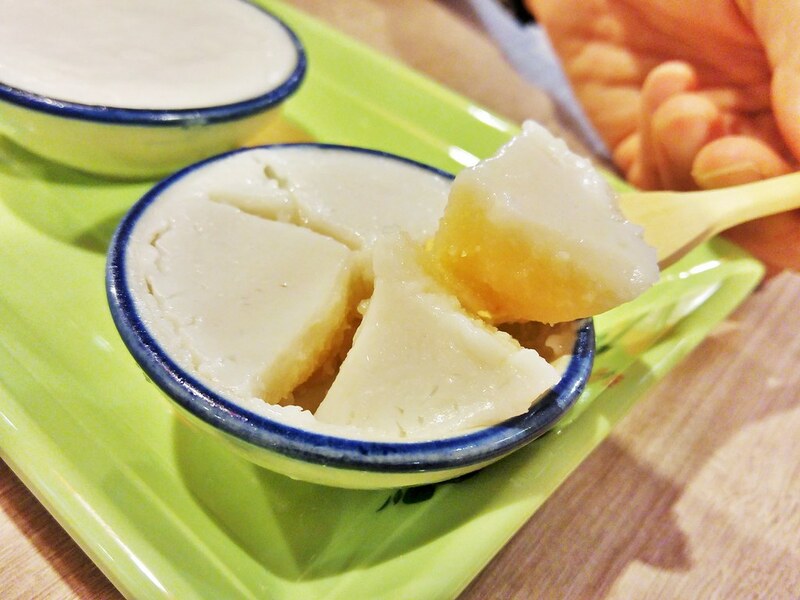 Ka-Nom Tuay - a traditional steamed coconut custard. The sweet coconut flavour is a taste of nostalgia. In Bangkok, one may find it hard to identify the real Yentafo Kruengsonge by Madam A. Mallikaun as there are a handful of other brands around selling the same thing. However, since this is the first and only in Singapore, there's no way that you will mistaken it, especially with their trademark rooster earthenware. Comfort food priced reasonably, I'm quite sure this Thai Yen Ta Fo will make it mark here in no time. Written and photography by Si An. A girl who is allured by travelling, loves the feel of freedom, smell of the rain and the aroma of fine coffee and food. Note: This is an invited tasting.